I'll admit to being a snob when it comes to fall mums. They're not my favorites. Oddly enough, I like their fragrance, which many people do not, but I'm lukewarm on the typical form on the typical bedding mum. That is, until this year when I grew 'Pumpkin Igloo' from Blooms of Bressingham. I didn't expect to like it, but planted it after receiving it from the company to try in my garden. Instead of the muddy burnt orange I'd expected, these little beauties featured a glowing deep peach--just enough saturation to make them stand out on a gloomy day, but with a softness that puts them above the rest. I especially love their bright yellow centers and double-ish form. 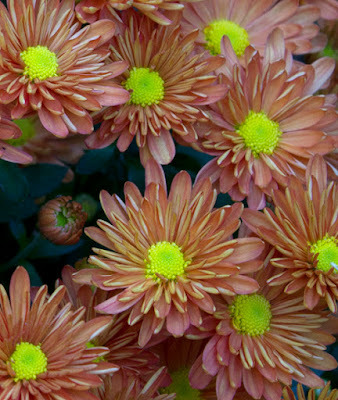 Like a button in the center of the cushion, the center of 'Pumpkin Igloo' does what it's meant to in keeping back the perky, partly quilled inner petals. 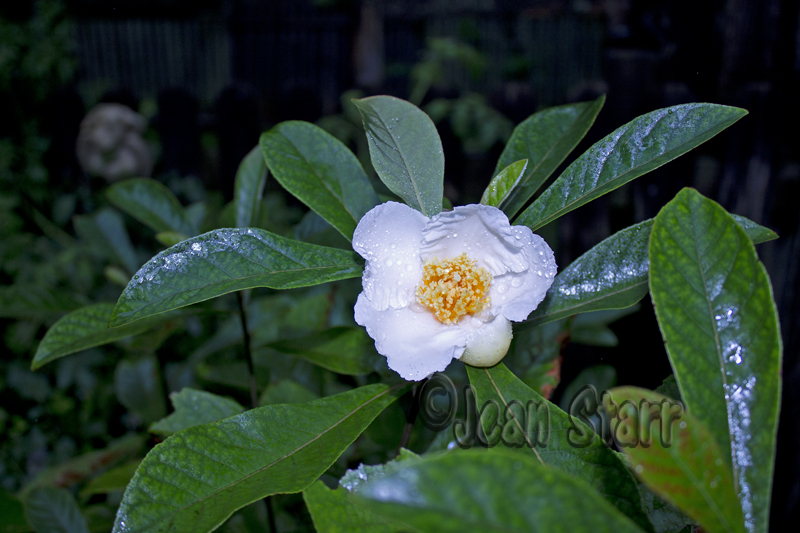 Taking a page from fellow-blogger Carol Michel in May Dreams Gardens, not to brag but my Franklinia alatamaha bloomed this year. I had two flowers on this mysterious disappearing native tree. For details, see the Penn State Extension tree site. With this tree, it's just a matter of keeping it alive. It's not thriving, though it seemed to have been able to take care of itself at one time on the banks of the Altamaha River in southeastern Georgia in 1765. That's when two explorers discovered it and brought it back to civilization. Although its blooms are said to be fragrant, I've not detected a scent, but there is no denying its beauty. It wasn't its beauty that attracted me, but its name. Who could resist a flower called 'Lambiekins'? 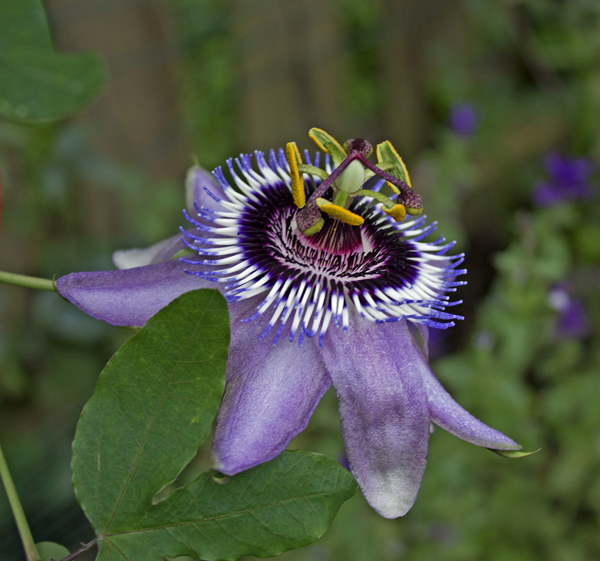 Passiflora 'Lambiekins', to be correct. I ordered one from Grassy Knoll Exotic Plants, knowing I couldn't give it as much sun as it would like. It is extremely vigorous and generous in its size. My plant was stingy with its flowers, but through no fault of its own. It only gets about three to four hours of direct sun, after all. Its first bloom didn't arrive until late August. I probably got about half a dozen flowers from this tropical passion flower. 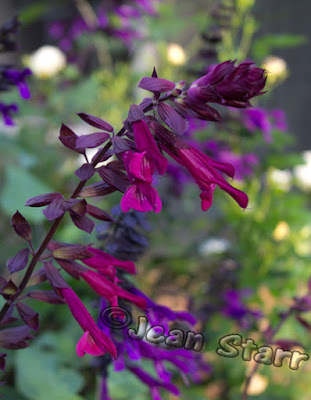 Two varieties of Salvia provided me with great color and entertainment through the late summer/early fall season. The giant of the two is 'Amistad', a deep blue variety that's covered a space of six feet by six feet, providing a succession of blooms by July. It hit its stride in August, stretching its stem and becoming the obsession of our two resident hummingbirds. Its Salvia companion, called 'Love and Wishes' didn't get as large but performed like a trooper despite its raucous neighbor. Both Salvias came from Flowers by the Sea, a place with some really cool plants. The cool back story about 'Love and Wishes' is its parentage. According to Flowers by the Sea, it was hybridized by Australian retiree John Fisher when he crossed it with Salvia x 'Wendy's Wish'. He decided its sales, like its parent plant, should benefit Australia's Make-a-Wish Foundation. I grew 'Wendy's Wish' a couple of years ago in a very large container and loved it. The only variety of this special trio I haven't grown is 'Ember's Wish'--and yet another plant to look forward to growing next year. You have some lovely fall blooms.